When the Environmental Protection Agency (EPA) designated the Occupational Health and Safety Administration (OSHA) to be responsible for the health and safety of workers in and around areas of hazardous materials and contaminated waste, OSHA responded by formulating an all encompassing compendium of safety regulations that prescribe operating standards for all aspects of OSHA projects. Almost 2 million people are affected by the OSHA Standard today. In 1990, additional standards proposed and developed by the National Fire Protection Association (NFPA) and the American Society for Testing and Materials (ASTM) were accepted by OSHA. NFPA Standard 1991 set performance requirements for totally encapsulated vapor tight chemical suits and includes rigid chemical and flame resistance tests and a permeation test against 21 challenge chemicals. The basic OSHA Standard calls for 4 levels of protection, A through D, and specifies in detail the equipment and clothing requited to adequately protect the wearer at corresponding danger levels. 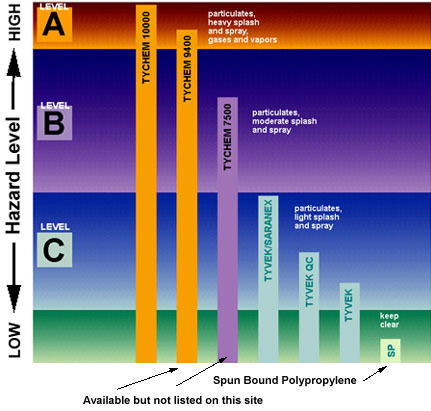 Level A represents the greatest danger of respiratory, eye or skin damage from hazardous vapors, gases, particulates, sudden splash, immersion or contact with hazardous materials. It calls for total encapsulation in a vapor tight chemical suit with self-contained breathing apparatus (SCBA) or supplied air and appropriate accessories. Level A chemical protective clothing can also be manufactured to meet NFPA 1991 specifications. Level B situations call for the highest degree of respiratory protection but a lesser need for skin protection. It calls for SCBA or positive pressure supplied air respirator with escape SCBA, plus hooded chemical resistant clothing (overalls and long sleeved jacket; coveralls; one or two piece chemical-splash suit; or disposable chemical-resistant coveralls.